Mr Musharraf has previously said he would resign rather than face impeachment proceedings but he has made no comment yet on the latest move. They also promised to restore judges sacked under Mr Musharraf’s emergency rule once impeachment was successful. 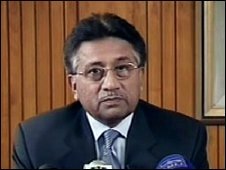 One presidential source told Agence France-Presse news agency Mr Musharraf was discussing a course of action and had the options of dissolving parliament or imposing emergency rule again. 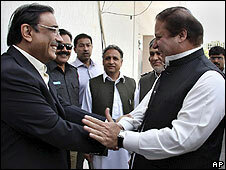 Party leaders Asif Ali Zardari and Nawaz Sharif made the announcement after two days of talks. They would need a two-thirds majority to impeach. 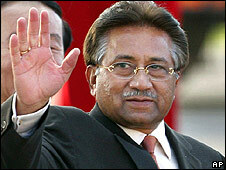 Mr Musharraf has previously said he will resign rather than face impeachment proceedings. 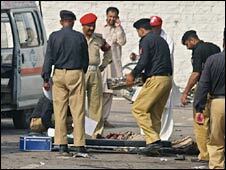 Pakistan has been ruled by military leaders for more than half of its existence since Partition in 1948. 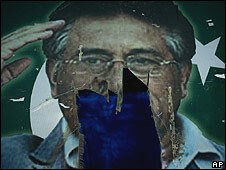 Pakistan’s ruling alliance is expected to decide whether to begin moves to try to impeach President Pervez Musharraf, following three days of talks. Mr Musharraf has delayed his departure to China to attend the opening of the Olympics, after earlier suggestions he might cancel the trip entirely. The president’s allies were defeated in elections in February, but he has so far resisted pressure to quit. 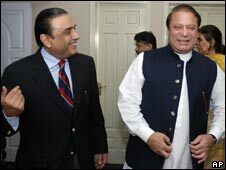 The governing coalition is divided over whether to impeach Mr Musharraf. Latest reports from Islamabad quote “senior coalition sources” saying a deal has been reached in principle on impeaching the president, but these have not been confirmed. Correspondents say it is also far from clear whether the ruling alliance could muster the required two-thirds majority needed in both houses of parliament. The president was due to leave for the Chinese capital, Beijing, on Wednesday but at the last minute the trip was cancelled. No reason was given. A statement from the foreign ministry later said that he would leave for China on Thursday. “In view of our special relations with China, the president has decided to attend the opening ceremony of the Beijing Olympics,” said the foreign ministry statement on Wednesday. China is one of Pakistan’s closest allies, and it would have been highly unusual for a Pakistani leader to call off a visit at such short notice. 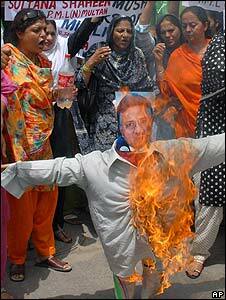 The question of whether or not to impeach Mr Musharraf has threatened to divide the governing coalition. Early in what was a dramatic day on Wednesday, the threat of a new opposition onslaught appeared sufficient to force him to cancel his Beijing trip. Yet by evening a spokesman said he would travel as planned. That Mr Musharraf felt confident enough to fly to China would suggest to many Pakistanis that for now at least he feels more secure in his position, our correspondent says. The president has previously said he would prefer to resign than face impeachment. Last year, he gave up control of the army, the country’s most powerful institution, but he retains the power to dissolve parliament. How the military reacts to any efforts to oust him would be crucial in determining his fate. 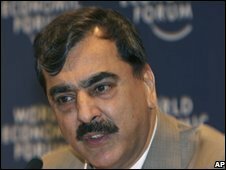 The governing Pakistan People’s Party (PPP) and its alliance partners appeared deadlocked by Wednesday evening over the impeachment moves. At one point, former Prime Minister Nawaz Sharif stormed out following the announcement that Mr Musharraf had issued orders to reinstate some of Pakistan’s top judges. Mr Sharif argues that the president is attempting to divide the governing coalition. But progress appears to have been made since then. PPP spokesman Farhatullah Babar told the news agency AFP work was under way “to finalise the draft of a joint statement” by Thursday evening. 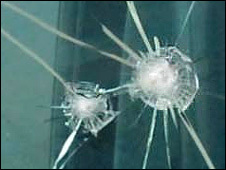 A spokesman for Mr Sharif’s party also said an announcement was due. 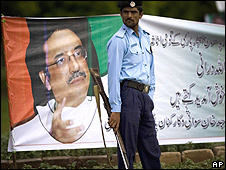 Mr Musharraf’s political allies were defeated in February elections, from which the PPP emerged as the largest party. 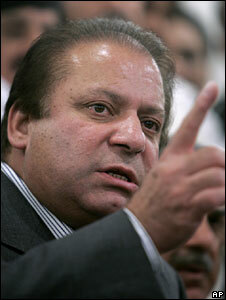 In second place was the PML-N of Mr Sharif, whom President Musharraf ousted in a 1999 coup. 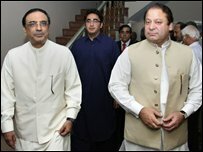 The two parties formed an alliance in March, but have since been split over the issues of presidential impeachment and the reinstatement of judges sacked by President Musharraf during a state of emergency in November. The PML-N pulled out of the federal cabinet in May when PPP leader Asif Ali Zardari refused to move immediately on these issues. The rift has caused a sense of paralysis in the government, which is under pressure to tackle militancy and a worsening economy.